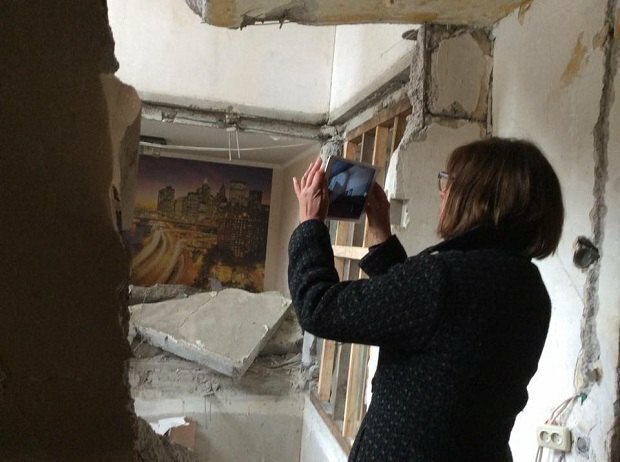 Since the beginning of Donbas hostilities, 1,032 homes in the private sector and 91 high-rise buildings in Avdiyivka were damaged. 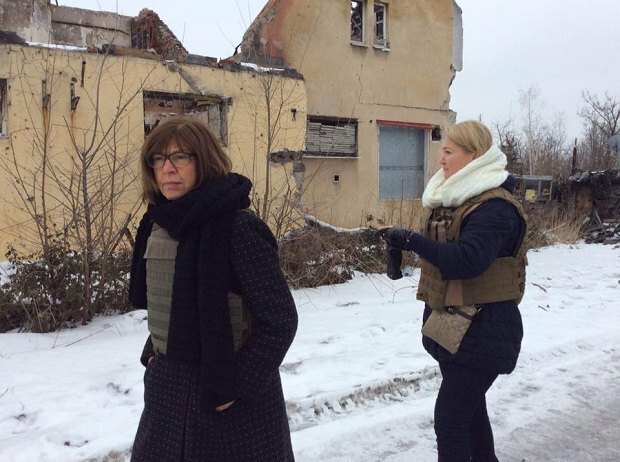 A member of the European Parliament Rebecca Harms and the First Deputy Chairman of the Verkhovna Rada Iryna Herashchenko and Ukrainian MP Mariya Ionova have visited Avdiyivka. 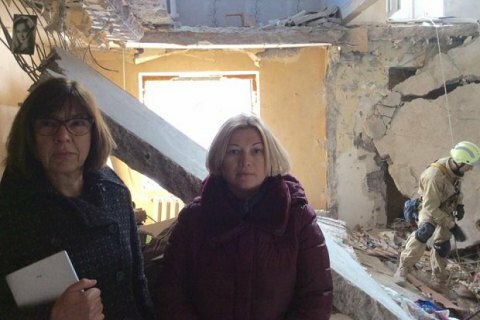 In a Facebook posting on 20 February Herashchenko reported about visiting together with MEP Rebecca Harms and MP Mariya Ionova the houses hit by the shells of the opposite side on 17 February. "Two teenagers who have played a computer in the room, of which remained walls with wallpaper, have narrowly survived. The kids were buried under a collapsed wall but a guardian angel must have been with them. A man in nearby house was killed in a tank fire attack from Horlivka ... Rescue teams are delving in the rubble," wrote Herashchenko. According to the lawmaker, 328 Avdiyivka buildings, including two on 19 February, have been destroyed since the escalation on January 29, were damaged. Overall, 1,032 homes in the private sector, and 91 high-rise buildings in Avdiyivka have been destroyed or damaged since the beginning of hostilities. 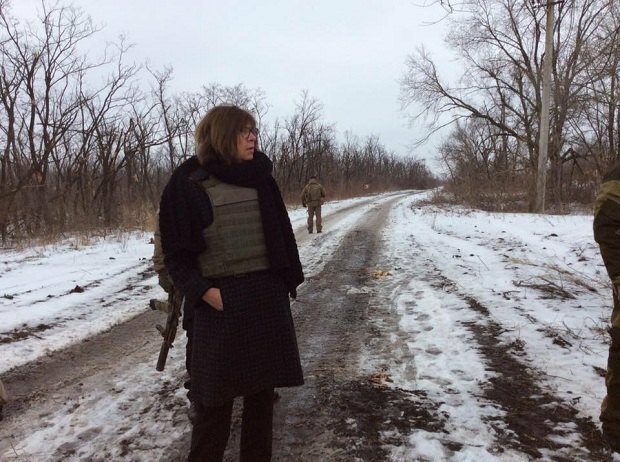 "Rebecca is shocked, although this is not her first visit to Donbas. On Sunday, Avdiyivka was again de-energized and left without water due to the shelling, so repair works to give civilians the water and the light are underway. As we roamed around the rubbles, we kept hearing distant sounds of gunfire. Interestingly, Europeans and ambassadors who argue for elections in Donbas, are they ready, like Rebecca, to come around to Avdiyivka for least a couple of hours," Herashchenko wrote. She stressed that the Ukrainian side considers the attempts of provocation by militants a gross violation of the Minsk agreements. "By the way, Rebecca Harms said that it is an important fact that is little understood and known in Europe: Ukrainian positions are far away from the contact line, fixed in the Minsk agreements in September 2014, because these agreements have been violated by Russia and militants. She said she would communicate this information to European partners and colleagues," added Herashchenko. The Trilateral contact group on Donbas settlement early this month reached an agreement on the pullout of heavy weapons by 20 February and the beginning of the truce. However, the headquarters of the ATO reported on Monday morning that militants continue to fire making the weapons withdrawal impossible.